GLENN: Sailing has been part of the fabric of my life since I was a kid. It’s been my passion away from my career in the software business. Some of my happiest and scariest moments have been on a sailboat. I’ve gone long stretches where other life priorities kept me off the water, but I’ve always returned; and each time with a higher level of skill, purpose, and desire for adventure. I’ve shared my onboard experiences with my wife, children, friends, and complete strangers. While not always in comfort, we’ve had truly life enriching moments together. I always loved being around boats as a kid. The highlight of my childhood summers was our annual pilgrimage to my grandmother’s house at the South New Jersey shore with my cousins. We would hang out at the local marina watching boats come and go, amazed at the boat handling skills of the captains, and wondering where they went. Sadly, I was very seasick when my dad would take me on fishing trips, and being on the water was not initially very comfortable. Turning 12, I mustered my courage and taught myself to sail on a Sunfish (basically a paddle board with a rudder and a sail). How proud I was to figure out how to use the wind and sails to control the boat. Since I wasn’t old enough to drive a car, sailing was one of my earliest outlets for adventure and independence. I’ll always be grateful to the Townsend Inlet Yacht Club for inspiring me! Living in central Virginia and not coming from a sailing family, I had no opportunity to sail until my senior year in college when I decided to join an organized spring break sailing trip. While aboard our chartered 40ft Morgan in the out islands of the Bahamas, I experienced my first Gulf Stream crossing and true blue water sailing. Unfortunately, during the trip, the “professional” charter skipper demonstrated that he was not a competent sailor. On his watch, our boat ran out of fuel and drifted miles from land in the middle of a gale. I vowed never to sail again until I had the requisite skills to skipper the boat. Pamela and I married shortly after finishing our undergraduate degrees and started our careers in the Washington, DC area and enjoyed many weekends in nearby Annapolis and cruising on the Chesapeake. This was B.C. (before children) when weekends were our own. With urging from a friend, I had achieved all my ASA certifications and was teaching weekend classes for a sailing school in Annapolis. I developed my seamanship skills as we navigated our way around the Bay, each time motivated by the anticipation of cold beer, oysters, and blue crabs at the next destination. The northern Chesapeake bay is a busy waterway and its cargo ships, narrow channels, and quick-forming summer squalls kept us on our toes. Over time, I gained confidence in my skills to get us safely to the next harbor. Pamela enthusiastically assumed the role of caterer and self-appointed “galley wench” while indulging me and my growing passion. Though often tempted, we never bought a boat. We either chartered or were invited to crew aboard friends’ boats. We still cherish our memories of those Chesapeake Bay weekends! As we entered our 30s, our new family and my career were to put the sailing passion on the back burner for a decade. PAMELA: Growing up I always enjoyed the water! Early memories of beach vacations and country club pool hi-jinks are very fond. But – my first memory of sailing is a wild-eyed Glenn returning from his hare-brained scheme to go on a “sailing trip” for Spring Break! What was he thinking? He regaled me with his tale of storms, cut anchor lines, running out of gas, incompetent captain, and ill-equipped boat – and, he couldn’t understand why I was nervous about sailing?!?! I was comforted by his vow to never go sailing again until he had the skills necessary to make sailing safe and enjoyable. So … we moved to DC and spent many memorable weekends during our 20’s sailing the Bay. I was the “galley wench” and enjoyed every moment of it. I learned that I could enjoy my two favorite past times – cooking and entertaining – while sailing! Then, as the saying goes, life intervenes. We turned 30. Children started popping out. We moved to land-locked Atlanta, and sailing was on hold. I was kind of thinking that Glenn had gotten it out of his system….. 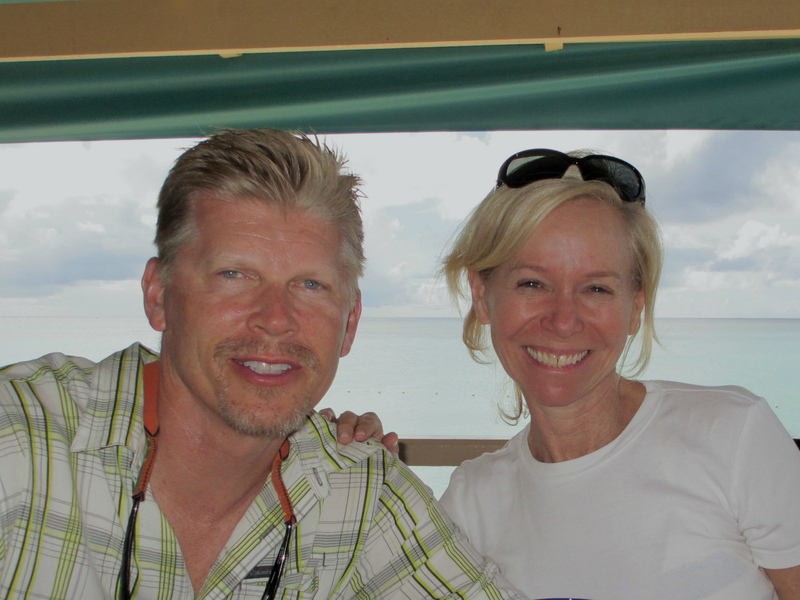 But, as we were planning our 10 year anniversary trip – (thank you Grandma Balsinger for all of those birthday checks) Glenn professed his desire for spending a week chartering a boat and sailing in the BVI. Whoa! I don’t think so!!! We compromised with a 3 night charter with a captain and cook, and the rest of the two weeks were spent at the Bitter End Yacht Club – sailing, sunning, enjoying. Two things happened – one, Glenn was forever hooked. He vowed to get all the certifications necessary to captain his own sailboat, and the family was gonna be his crew. Two, I realized that I had a new hobby that I better learn to like! But, seriously, the next 20 years were spent taking amazing adventures with the family – white water rafting in Utah, snow skiing in Colorado, hiking in Hawaii – but, the very best adventures were – sailing as a family! Drop the anchor at sunset, dive overboard and snorkel the rocks along the little secluded bay that we tucked our sailboat into – it doesn’t get any better than that! GLENN: By our early 40s, our children had become old enough for more adventurous vacations than Disney World and the beach. So, with the goal of taking the family on sailing vacations, I set out to refresh my dormant sailing skills. During a career break, I flew down to Steve Colgate’s Offshore Sailing School in the Caribbean. With my renewed confidence and skills, we began a tradition of annual (or semi annual) bareboat charter trips throughout the Caribbean and Mediterranean with Captain Dad. Away from the “always on” demands of the internet and social media, we bonded as a family in deeper and more meaningful ways than we could have imagined. Upon turning 50, I was compelled to push myself outside my comfort zone with a greater sailing challenge. I had long dreamed of sailing across oceans and was beginning to notice more than a few grey hairs. I guess you could call it a “bucket list” goal. So after 3 years of transitioning into my present career as a venture capitalist, I found a window to take a 30 day hiatus and flew to Africa to begin my next adventure. Friends and family wished me well. Some were envious but I think most (including my partners) thought I was a little nuts. Swimming in the middle of the Atlantic Ocean! Upon landfall in Barbados, I’ll never forget the feelings of accomplishment and joy which I shared with my family who had flown down to greet me. Together, we celebrated a very special and memorable Thanksgiving in Barbados. Back home, I joined up with a group of seasoned sailors at the closest thing we Atlantans have to an ocean, Lake Lanier. Over the following few seasons of Wednesday night beer can racing and weekend regattas, these guys patiently taught me the precision skills of competitive racing and we are a good crew. Thanks to Jeff Freeman and the crew of Renegade (a Flying Tiger 10M) at Lake Lanier Sailing Club. PAMELA: What to say? Mid-life crisis sounds so trite and common place, but it accurately describes how I felt. My job was done. The children were fiercely independent and had created their own lives for themselves. Don’t get me wrong – we cherish any time together as a family, but day-to-day – they were so happy and accomplished. Grandchildren were a distant longing. A window of opportunity was emerging for Glenn and I. I did some serious soul-searching and realized that my love for travel and adventure and sailing could solve my dilemma! Let’s take this special time for the two of us – explore as much of the world as we can – before the patter of little feet and sore joints make the dream a little bit harder to accomplish. So …. we headed off to the boat show circuit! GLENN: We were fast approaching the empty nest stage of life and I was taking stock of all our blessings…. a great family, a circle of close friends, a rewarding career, a wonderful wife, and good health. While sharing a nice bottle of wine one evening, we got to talking about our new phase of life. Pamela said “We’ve talked about buying a sail boat for years. What are we waiting for?” She was all in. And so, we began plotting our course to becoming sail boat owners and blue water sailors.